The Enigma machine was the German cipher machine used to encrypt their WW2 communications and systematically cracked by the Bletchley Park Codebreakers. 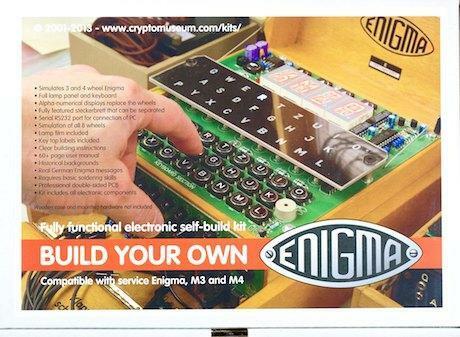 This highly detailed replica design gives you the ability to build your very own Enigma machine. It came in at £150 and had no moving parts, there is an additional Uhrbox-E module (the Uhrbox-E is the equivalent of the famous Enigma Uhr that was introduced by the German Luftwaffe in 1944 in an attempt to make the Enigma more secure) you can buy for £60! Bob and I at that moment decided to work out if we could build our own! The Mag Pi Issue 25 (link) has an discussion about using Python to make a one wheel enigma machine, I want to try and make a physical three wheel machine, with plug board. The full details of the PCB are available at this site, the kit seems to use a PIC as a micro controller, I plan on making mine a purely mechanical solution with any microcontroller being used for supplementary functionality. HackADay has a good primer on how the Enigma Machine works, I will do some research and write another post soon.